With regards to the medical benefits of marijuana, the most attention has been placed on the effects of Tetrahydrocannabinol (THC) and Cannabidiol (CBD), with little to no emphasis placed on terpenes. 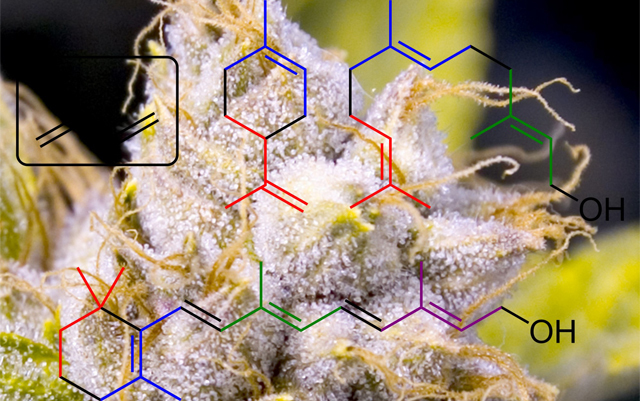 Although we know very little about terpenes, they are commonly found in our society. In fact, many of the essential oils available to us in stores contain terpenes. Cannabis is one of the plants that has a strong terpene presence. Terpenes are responsible for the distinct smells of the different cannabis strains. So far, experts have found that there are 120 compounds in the cannabis plant.3 Of these, terpenes are among the major components, along with THC and CBD. Some popular terpenes are Pinene, Myrcene and Lemonene. With the growing interest in the properties of cannabis terpenes, there is no doubt that much more is in store for these aromatic compounds in the medical marijuana industry. Researchers have uncovered that the reaction terpenes have with cannabinoids makes the plant much more useful when it comes to treating several health conditions. One study, titled Taming THC1 and carried out by Ethan B. Russo of GW Pharmaceuticals in the UK, revealed that due to the synergistic interaction of terpenes and cannabinoids the plant can be used to successfully treat undesirable medical conditions like methicillin-resistant Staphylococcus aureu (MRSA) and depression. As a result of his study, Russo urges cannabis cultivators to pay more attention to terpenes in their cannabis crops as they breed new plants. Currently, there are already cannabis cultivators that are putting more emphasis on the terpenes in their plants, such as Green House Seeds4 in the Netherlands. As terpenes gain more popularity and the demand for them rises, we can expect that more cultivators will start breeding terpene-rich cannabis plants. To get the most terpenes from the buds of the cannabis plant, it is recommended that persons opt to use a vaporizer rather than smoking, as terpenes are easily destroyed by the direct heat. Vaporizers are seen as much more effective for maintaining the terpene levels as well as the raw flavor and aroma of the herb.